The new apartheid ("apartness" in Afrikaans) laws would maintain white supremacy by forcing all South Africans to identify as European, Indian, colored (mixed-race), or African, and segregating these “races” from each other as much as possible. Non-whites were forcibly relocated to isolated, poverty-stricken areas, made to obtain permission to travel, blocked from voting and participation in government, not allowed to marry whites, and were largely barred from owning land. Non-whites in South Africa had resisted discrimination for decades, but they were unable to bring about real change, and in incidents such as the 1960 Sharpeville massacre and the 1976 Soweto uprising, the state cracked down harshly on protestors, arresting leaders like Nelson Mandela and killing others like Steve Biko. In the late 1970s, grassroots civic associations sprang up in black townships to begin a new approach to activism that focused not on political action but on community development. Popo Molefe declared that the movement needed to work on local issues in order to give people "the confidence that through their united mass action, they can intervene and change their lives, on no matter how small a scale." Activists began mobilizing local communities around issues like rent increases, fees for basic services like water, and forced relocations. By putting pressure on authorities through demonstrations, refusal to pay rent, picketing, and boycotts, activists made small, tangible gains. However, they knew that they had to maintain a larger vision: "We must see the increasing rents, bus fares and electricity charges as being only the smoke. Our work must be geared to extinguishing the fire which causes the smoke – the system of apartheid." The movement leaders viewed local campaigns on civic issues as a "base of first-level grassroots organization," from which activists could "start to build progressively more political forms of organization – a process which would culminate in the development of a national democratic struggle," according to Molofe. This national struggle would work towards a basic goal, simply put at the 1983 founding of the United Democratic Front (UDF): "We want all our rights, and we want them here and we want them now." To accomplish this goal, activists knew they had to move beyond a series of spontaneous uprisings to build a nationwide organization. And, as the young leader Mkhuseli Jack declared, they needed to "take this fight in the townships…right to [white South Africans'] homes. And that is what led to the boycott." The goal was to put pressure on the government by decimating the local economy, thus demonstrating that the country could not continue under apartheid; as Molefe put it, "We were saying to business[es]: you are part of this country. If the majority of South Africans are not treated like human beings, [if] their human rights are not respected, there cannot be stability in the country, and your business cannot thrive under conditions of instability." At the same time, the movement needed international support to overcome apartheid. "We face a catastrophe in this land," declared Archbishop Desmond Tutu, "and only the action of the international community by applying pressure can save us." He called for "punitive sanctions against this government to help us establish a new South Africa," with the support of more than 70 percent of black South Africans. They knew that sanctions would cause short-term economic suffering, but they accepted this as a "[price] that we are willing to pay for our freedom." By inspiring international protests and media coverage, they convinced a growing number of states to levy sanctions against South Africa. By pressuring the government both at home and from around the world, the anti-apartheid movement made it increasingly clear that the apartheid system could not continue, and that the government would have to give in. The United Democratic Front (UDF), founded by Mkhuseli Jack in 1983, took the lead in organizing the anti-apartheid movement in the 1980s. This decentralized coalition of over 500 anti-apartheid organizations sprang up in response to limited government reforms that attempted to weaken the position of anti-apartheid activists. After the regime's 1986 crackdown, the black Confederation of South African Trade Unions (COSATU) also played a large role in leading the anti-apartheid movement through strikes. Meanwhile, by organizing on a local basis, black communities began to take ownership of their own government, creating street committees that wrested power away from the local councils that were complicit in apartheid. Committees that were formed in township streets would elect delegates to serve on area committees, which in turn selected organizers to work with national organizations. The committees not only mobilized local communities to participate in strikes and boycotts; they also settled disputes and organized services such as policing, street cleaning, garbage removal, and health care. The movement had “broken the shackles of direct government rule” and, through self-governance, begun to create "people's power now, in the process of struggle, before actual liberation." Furthermore, through local organizing, the movement engaged ordinary people in a non-threatening, non-violent way. The movement also needed support from moderate and older members of the black community, many of whom had been alienated by previous violence and extremism. Young activists held local meetings in which they gave older blacks an opportunity to take leadership roles. In this way, they won their trust and gained a hugely important source of intergenerational support. The South African regime cracked down on the anti-apartheid movement again and again, most severely in the late 1980s. After declaring a state of emergency in 1986, the government arrested more than 25,000 people and imprisoned them without trial. Censorship regulations prevented local media coverage of anti-apartheid actions, other than simple reprints of official statements. The government banned non-violent actions like work stay-aways and boycotts, all of which were classified as forms of “subversion,” along with street committees. In 1988, the government banned all political activities by the UDF and COSATU, along with dozens of other anti-apartheid groups. Police forces were expanded to the point of a virtual military occupation, as councilors returned to the townships to wrest their power back from the street committees. Government intelligence services launched covert operations against anti-apartheid leaders, including break-ins, bombings, and assassinations. The police tortured many prisoners and even deliberately provoked violence in order to kill blacks. Ultimately, the regime's repression backfired. Previously, countries like the United States had been hesitant to oppose South Africa, which was a Cold War ally. But after heavy media coverage of the 1986 crackdown prompted local protests around the world, the United States and the European Community imposed sanctions on South Africa, and new investments, loans, and South African imports were cut off. This only increased the growing recognition among South Africans that the situation could not continue. The central message of the anti-apartheid movement was that apartheid must end, and that black South Africans must be given their rights. The movement needed to convince the white minority that apartheid was unsustainable. In order to do so, black South Africans exerted their power as the majority of the population via "defiance campaigns": non-violent tactics of non-cooperation with the system. The leveraged their economic power through rent boycotts, consumer boycotts of businesses owned by whites or black apartheid collaborators, student and worker strikes, and work stay-aways. The consumer boycott was a particularly effective tactic; by decimating profits, it drove a wedge between business and government as white store owners put pressure on the government to change policy. Moreover, this was a tactic immune to government oppression; as the police intelligence chief said, "If they don't want to buy, what sort of crime is it? It’s mass action, and what do you do? You can’t shoot all those people. You can’t lock them all up." Black South Africans also refused to cooperate with the government's appointed officials in township councils. In the mid-1980s, a wave of violence swept across the townships as black councilors, police officers, and suspected informants were murdered. Government authority in the townships collapsed, and local organizers filled the power vacuum with street committees. However, it is important to note that the violent acts leading to the mass resignations of local councilors resulted in an escalation of the regime’s oppression, while non-violent acts of non-cooperation resulted in many small victories. At the same time, activists worked to secure international attention by highlighting segregation and provoking police brutality. In 1989, the movement mobilized crowds to defy apartheid on beaches and in hospitals, while organizing protests and a work stay-away. At the same time, they used civil rights language that would strike a chord with civil rights activists abroad. Detainees in jail joined in, using hunger strikes to attract international publicity, as well as to pressure authorities to release them or to improve prison conditions. Meanwhile, Nelson Mandela persuaded prison authorities to let him send faxes and make calls from his jail cell to coordinate leadership of the movement; he also became engaged in secret talks with the government to find common ground for future negotiations. To succeed, activists knew that they had to work across racial lines; as Molefe said, "uniting the largest section of South Africans committed to a peaceful and just future" was the key. The UDF’s membership spanned whites, blacks, and Indians; it included labor unions, students, civic associations, women’s groups, and churches. 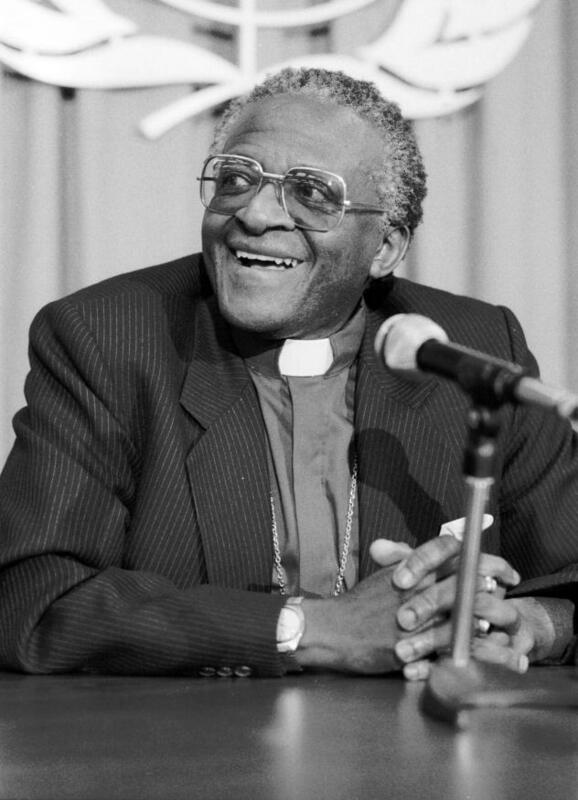 Churches served as meeting places, clergymen such as Desmond Tutu helped rally support through public speeches and organizing, and the South African Council of Churches defended political prisoners and supported their families. White groups such as the National Union of South African Students also joined in, along with Indian groups. As the anti-apartheid movement gained international support, it gained strength from a series of campaigns: an academic boycott of South African universities and scholars, a sports boycott that banned South African teams from the World Cup and the Olympics, and a divestment campaign that drained economic assets from the country. As the anti-apartheid movement grew to a global scale, the international community recognized its leaders with Nobel Peace Prizes for Desmond Tutu in 1984 and for Nelson Mandela in 1993. Ultimately, the local and international pressure on the South African regime led to the realization that "the time for negotiation has arrived," as the country’s new president, F.W. de Klerk, said in 1989. The next year, Mandela was released from prison, and the apartheid laws were repealed. 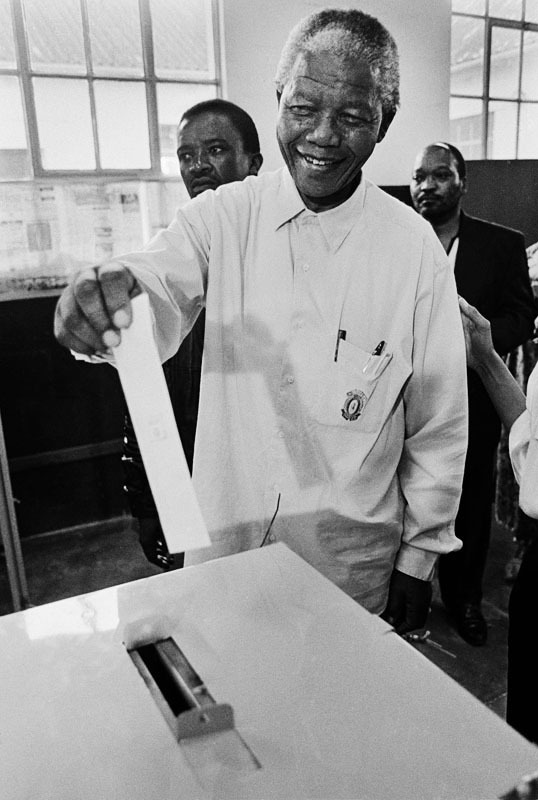 After negotiations, democratic elections were held in 1994, and Mandela was elected president of the new South Africa. The country would become a parliamentary democracy based on the “one man, one vote” principle, and for five years, all major political parties would be represented in a transitional government. After decades of apartheid, Mandela declared, "never again shall it be that this beautiful land will again experience the oppression of one by another." The story of the anti-apartheid movement serves as proof of Desmond Tutu’s declaration that "once a people are determined to become free, then nothing can stop them from reaching their goal." Community Video Education Trust: Documentary Footage of the Anti-Apartheid Struggle in South Africa - a digital archive of video footage documenting anti-apartheid demonstrations, speeches, mass funerals, celebrations, and interviews with activists. Digital Innovation South Africa - a scholarly resource focusing on the sociopolitical history of South Africa, particularly the struggle for freedom during the period from 1950 to the first democratic elections in 1994. The Heart of Hope: South Africa's Transition from Apartheid to Democracy - contains transcripts of more than 100 interviews with South African political figures, as well as summaries of historical events by year and descriptions of historical background. South Africa: Overcoming Apartheid, Building Democracy (Michigan State University) - an educational resource containing original video interviews with 45 South African anti-apartheid activists, chronological units and essays, raw video footage documenting mass resistance and police repression, historical documents, rare photographs, and educational activities. South African History Archive - an independent human rights archive dedicated to documenting, supporting and promoting greater awareness of past and contemporary struggles for justice in South Africa. Ackerman, Peter and Jack DuVall. A Force More Powerful: A Century of Nonviolent Conflict. New York: St. Martin’s Press, 2000. Louw, P. Eric. The Rise, Fall, and Legacy of Apartheid. Westport: Praeger Publishers, 2004. Seekings, Jeremy. "The Development of Strategic Thought in South Africa's Civic Movements, 1970-1990." From Comrades to Citizens: The South African Civics Movement and the Transition to Democracy. Ed. Glenn Adler and Jonny Steinberg. New York: St. Martin’s Press, 2000. Sparks, Allister Haddon. Tomorrow is Another Country: The Inside Story of South Africa's Road to Change. Chicago: University of Chicago Press, 1995. Desmond Tutu calls for global solidarity with Iranian activists. Madiba: The Life and Times of Nelson Mandela. "The Rise of Apartheid." South Africa: Overcoming Apartheid, Building Democracy. Michigan State University. Robinson, Alonford James Jr. "Apartheid." African Encyclopedia. Marx, Anthony W. "Contested Images and Implications of South African Nationhood." The Violence Within: Cultural and Political Opposition in Divided Nations. Ed. Kay B. Warren. Boulder: Westview Press, 1993. Pg. 168. Ackerman, Peter and Jack DuVall. A Force More Powerful: A Century of Nonviolent Conflict. New York: St. Martin’s Press, 2000. Pg. 345-6. Seekings, Jeremy. "The Development of Strategic Thought in South Africa's Civic Movements, 1970-1990." From Comrades to Citizens: The South African Civics Movement and the Transition to Democracy. Ed. Glenn Adler and Jonny Steinberg. New York: St. Martin’s Press, 2000. Pg. 67. Ackerman and DuVall, pg. 348. "Tutu Risks Treason Charge in Urging S. Africa Sanctions." The Los Angeles Times. 2 April 1986. Boesak, Allan. "Sanctions Are the Price of Freedom: It's Apartheid, Not Foreign Pressure, That Causes the Suffering." The Los Angeles Times. 12 Aug. 1988. Louw, P. Eric. The Rise, Fall, and Legacy of Apartheid. Westport: Praeger Publishers, 2004. Pg. 131. Ackerman and DuVall, pg. 354. Ackerman and DuVall, pg. 361. Parks, Michael. " 'Prisoners in Our Minds': New Curbs in South Africa." The Los Angeles Times. 4 Dec. 1986. Parks, Michael. "South Africa Issues Sweeping Political Ban on 18 Groups." The Los Angeles Times. 25 Feb. 1988. Ackerman and DuVall, pg. 362. Blair, Jon. "When Memory Comes: Between Hope and History, a Nation Bravely Confronts Its Traumatic Past." The Los Angeles Times. 29 Aug. 1999. "Reigniting the Struggle: The 1970s Through the Release of Mandela." South Africa: Overcoming Apartheid, Building Democracy. Michigan State University. Ackerman and DuVall, pg. 357. Sparks, Allister Haddon. Tomorrow is Another Country: The Inside Story of South Africa's Road to Change. Chicago: University of Chicago Press, 1995. Pg. 52. Seekings, Jeremy. The UDF: A History of the United Democratic Front in South Africa, 1983-1991. Athens, Ohio: Ohio University Press, 2000. Pg. 33. Ackerman and DuVall, pg. 349. Mnookin, Robert. Bargaining with the Devil: When to Negotiate, When to Fight. New York: Simon & Schuster, 2010. Pg. 126. Mandela, Nelson. "Inaugural Address." Cape Town. 10 May 1994. Tutu, Desmond. The Words of Desmond Tutu. New York: Newmarket Press, 2007. Pg. 87.